Buttermilk Spelt Pancakes | Naturally. I am a lover of all things pancake. When M and I go out to breakfast, I always look to the pancakes first and if the restaurant is doing something fun and exciting- I nearly always order pancakes. For the most part, I feel like the actual pancake base gets overlooked because once you smother them in butter, maple syrup, and fruit- it’s hardly about the pancake any more. So today, I present to you a pancake that is all about the pancake (and just made better with a bit of fresh fruit, butter and maple syrup). I’m such a proponent of alternative grain cooking/baking not because of any special diet but rather the interesting flavors and textures each grain brings to the recipe (if you read my book, you know I mention this on what feels like every other page). While wheat is a perfectly acceptable pancake flour, spelt has become my go-to flour for my favorite breakfast treat. It’s got flavor and always trends on the bit sweeter side. Add spelt flour to buttermilk and these pancakes just melt in your mouth. If you want to go the extra mile, I also recommend trying sprouted spelt flour. I’ve been experimenting more and more with sprouted flours and fell head over heals for One Degree’s sprouted spelt flour (you can also make your own- Nourished Kitchen has a great rundown) . Combine butter and maple syrup in a small sauce pan or microwavable bowl. Heat until butter is melted and set aside to let cool slightly. Place flour, baking powder, baking soda and salt in a bowl, stirring a bit to combine. Whisk together the egg, buttermilk, and cooled butter mixture. Stir in to dry ingredients, just until combined. Let batter sit while skillet or griddle heats. Heat a skillet or griddle over low to medium-low heat. When skillet is hot (if you flick water onto the skillet, it should sizzle), take a scant ¼ cup of batter and pour onto skillet. Let cook for 1-2 minutes (until the pancakes begins to bubble slightly. Flip and let cook for another 1-2 minutes until pancake is cooked through. I’ve been wanting to experiment more with spelt flour because I’m always happy with the results after using it, and these sound like a perfect idea! Oh yum! I’ve never tried using other flours for pancakes, but if these are anywhere as good as they look I’ll have to give them a go! The warming weather here in the Midwest has me waking up earlier and earlier so taking time to make breakfast has become routine over these fast few weeks! 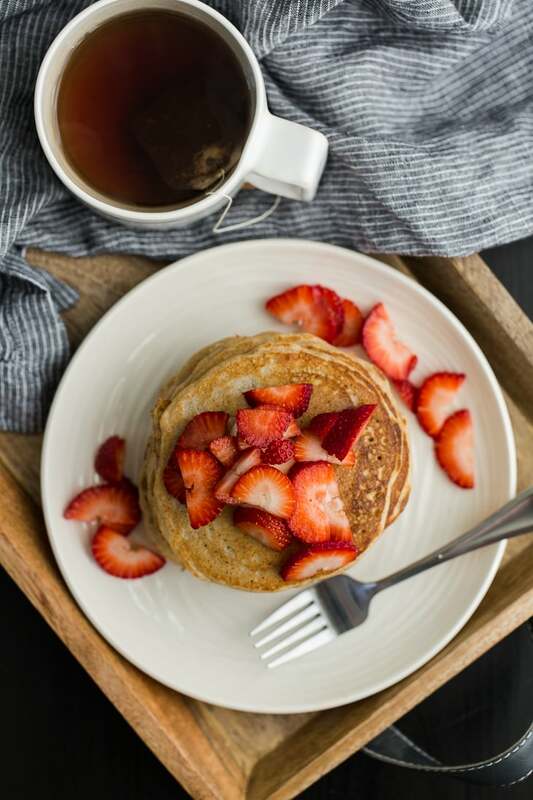 These pancakes will definitely have to be on my list to make during one of these lazy mornings as I’ve become obsessed with the nutty flavor of spelt flour as well! perfect to make on a Sunday morning yummy!! Yum! I’ve been wanting to try baking with spelt flour, and this will be the perfect place to start. I’m so jazzed about this recipe you have no idea. These look really yummy! I’m right there with you in that I love how using different grains can change the taste and texture of classic foods. I have been needing to try some spelt flour, it sounds so much better than regular plain or wholewheat flour. These pancakes look delicious, lovely and light, pinned! These look so great! 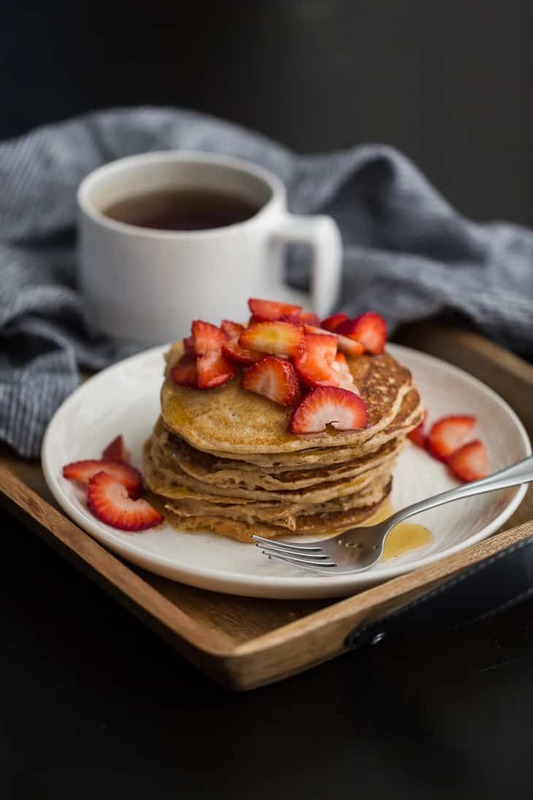 I really want to try out spelt flour (and these pancakes), where do you purchase yours from? I haven’t been able to find it in the shops near me, so I might have to visit Holland & Barrett if they do it there! Hi Besma- I’ve always ordered it online (from someplace like Bob’s Red Mill). I’m in the US, so I’m not 100% sure where you could find it in the UK locally, however. These sound so good, defiantly a weekend treat in the pipeline! I’ve never tried buttermilk pancakes before! This looks amazing! I have some buttermilk waiting to be used for something, so these pancakes are up next. You’re so right that the pancake base often gets overlooked, and that’s why I’m looking forward to trying these, especially knowing how well you pay attention to the small things in recipes that really do matter. The pancakes look really delicious and I want to try it. I’ve never heard of spelt before but I am going to “go outside my box” and try this. Thanks, Erin. Your recipes are amazing. These look great to me. I would be interested to try spelt flour, but I hope I can find it in small quantities, because I don’t use flour for much these days (pancakes, tortillas – and I don’t make those often). Would this batter work for waffles, do you think? Have you ever tried it in a waffle maker? Thanks! It *might* but I typically add more fats (butter) into my waffles to help them crisp up- so you could try a little extra butter + flour! Perfection! They look so yummy! Your blog is beautiful and these pancakes look delicious! I recently started a health and wellness blog of my own! Check out my most recent posts on the best vegan restaurants: http://www.thebrookeeper.com/food/5-awesome-vegan-eateries-you-must-try/. Happy blogging! I made these this morning (doubled the recipe and used canola oil instead of melted butter), and they turned out so light and fluffy and wonderful. I’ve never had whole grain pancakes turn out this light. Great recipe! Wow never thought about using spelt for pancakes! definitely a must try! I made spelt buttermilk pancakes this morning, and they were so light and fluffy they were like angelfood cake, if I had to make a comparison. I don’t measure all ingredients, as I rely on consistency to get the liquids right. Some things are approximate. One cup white spelt flour, VitaSpelt is good, and they carry it at health food stores. Measure the flour into a mixing bowl. Add two rounded tablespoons white sugar. Add half a heaping teaspoon baking soda and two three-fingered pinches salt. Combine the dry ingredients so all is mixed. Make a well in center of bowl. Crack two eggs into well. Pour in about a teaspoon or so vanilla extract. Pour in 1-2 tablespoons olive oil. Using a teaspoon, mix the wet ingredients so that the lecithin in the egg yolks emulsifies the oil and the egg whites are thoroughly mixed, incorporating some flour into like a dough in the center of the bowl. Then pour in some buttermilk. Start mixing it all together, adding more buttermilk by small increments until you have a thick batter. It should be like cake batter, but thicker. I have no idea the exact amount of buttermilk, as this is equivalent to titration in chemistry, and you will know when you reach the endpoint. The batter should pour off the spoon and not be doughy, but not be so thin as to spread too much when put in the pan. I don’t use baking powder. It contains aluminum. There is no need, as the lactic acid in the buttermilk will react with the sodium bicarbonate and form carbon dioxide to leaven the pancakes. Now you have a nice thick batter, and bubbles will be forming. Of course, you will already have a dry frying pan heated to about 250 degrees, and then spread some olive oil in it with a paper towel. It is important to watch the temperature of your pan, as too hot will turn the oil to varnish and smoke, and too cool will leave pale pancakes and cause sticking. Most people have been cooking long enough to have this basic knowledge, but you never know. Using the same tablespoon, the one you use at the table to scoop out potatoes, and the one you measured the sugar with, ladle spoonfulls of batter into the frying pan and wait. Bubbles will form on top of the cakes, the edges will go a bit dry. If you try to flip them and you haven’t waited long enough, they will fall apart, so you will know. Flip the cakes when they are ready. Wait again, sort of tweak them with the spatula to see if they have cooked thoroughly, and when they are ready, stack them on a serving plate. Like I said, these turned out well, and the buttermilk makes them really light and fluffy. If you do this enough times, it will be like second nature, and you won’t need to look up any recipe. These pancakes are so delicious!! I have had them twice in one week! Thank you for the recipe!! I just made these for my family for Easter breakfast, and they were a huge hit! The texture is perfect, and I love the nuttiness of the spelt flour. We enjoyed them with raspberry jam on top 🙂 I think this just became my go-to pancake recipe! These pancakes are amazing! The best spelt pancakes I have ever made. My little 2 year old loves them. Thank you! Wow!! I made these and they were wonderful. Very light and fluffy. I didn’t have buttermilk, so I did a buttermilk substitute, 6 oz yogurt and 2 oz milk. I will use this recipe from now on. Thank you!!! Lovely pancakes! Made a double batch this morning as I had buttermilk to finish. I used Sprouted Spelt Flour They ARE light & fluffy with a wonderful texture. The flavor of the Spelt stands out even with the addition of the maple syrup. They compliment one another. Actually you can eat them plain! Watch them carefully as they cook to prevent the bottoms getting to dark. When I use Sprouted Spelt flour, I allow the batter to sit a few minutes to absorb the liquid. If it seems too thick I add a bit of liquid. these pancakes didn’t need more liquid. the measurements were spot on. I weighed the flour. thanks for t he wonderful recipe.